Write a letter to Santa--and Send It! Help Students Learn During the Holidays: A Step by Step Guide for Writing Santa Claus AND Sending the Letters. Writing Santa is an especially helpful way to teach core skills during the holidays when additional distractions make student learning difficult. One way I liked to do this is through a focused letter writing activity. 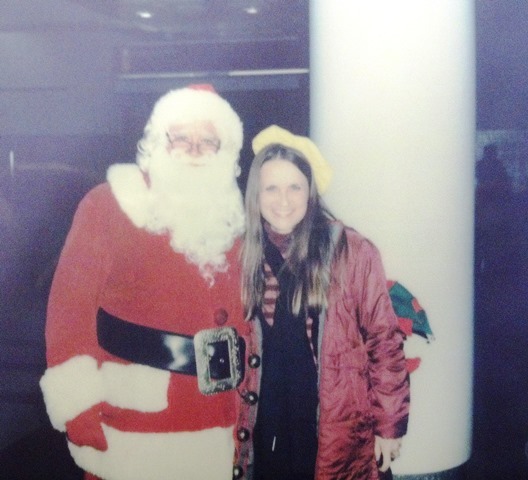 And, Santa Claus is the perfect person for students young and old to write to during the holidays. So, you can teach the skills mandated in the curriculum and let students think about the holidays. Here's a step by step writing guide for helping students create a focused, educational Santa letter. Note: The examples are suggestions for young writers, but you can adapt this lesson for older students. Using a “Hi Santa” to begin is a nice greeting. You could say, it grabs Santa’s attention quickly. I suggest only using “Dear Santa” if a student believes he or she has been a bit naughty this year. “Dear Santa” is more formal, which works well if you have a few things to confess. After greeting Santa, students need to express gratitude for the gifts he gave them last Christmas. Then they can tell him how good they’ve been all year. And, I don't mean vaguely saying they've "helped Mom." You want students to be specific ... since this is a learning assignment after all. 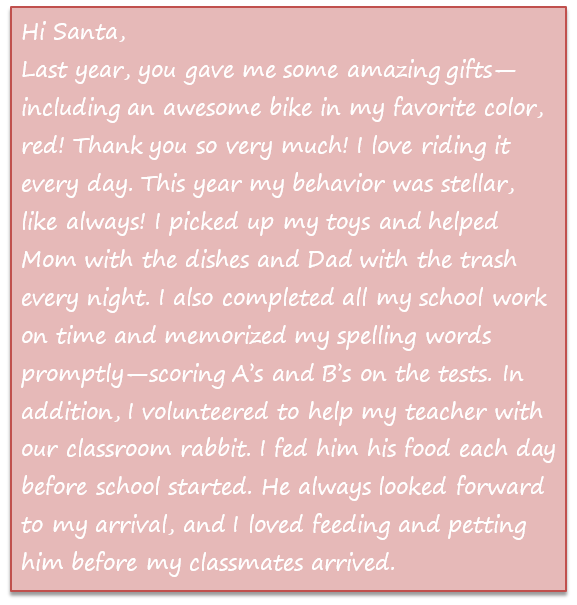 When students write a letter to Santa, encourage them to share all the really good things they did this year! Specifically, you want to SEE what that looks like in your mind. NOTE: For students who feel they have been less than stellar, they can share their mistakes and what they learned from them. Santa, like teachers and parents, likes to hear that students have grown from their mistakes. And, he may even give them a little extra treat! This may be the most important part of the letter. It's the whole reason kids write to Santa! 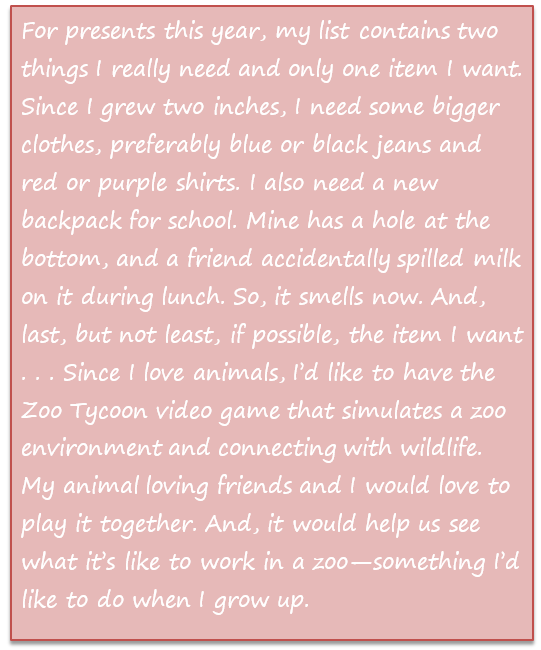 So, in this second paragraph, ask students to think about all they want for Christmas. And, be strict about that. Students must describe their chosen item (or items) in detail, where they first saw it, why it's important to them, why they must have it or need it, and/or what they plan to do with it once Santa brings it to them. Ask students to think about what they plan to do in the coming new year. Is there something they want to do or a place they want to go? May be it's taking Spanish lessons, learning to play the piano, singing at church, or helping their parents or another special person. In this paragraph, ask students to tell Santa about one of those things that is most important to them. It’s a great way to let Santa know how good they plan to be next year. The close is very special for any letter, but especially for a letter to Santa. Students will want to make him feel loved and appreciated. After all, he works hard all year and spends one entire night delivering presents. This last paragraph is a general "thank you again" for the gifts given during the previous year. 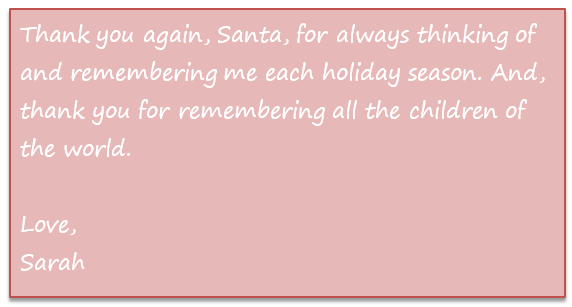 Students can also add any last comments or thoughts they want to share with Santa. Once the last paragraph is written, students will sign off with their preferred closing salutation. Some to chose from include love, sincerely, safe travels on Christmas Eve, blessings, or yours truly. I've done some checking around and included the most effective ways to send Santa letters. Because, younger students--most especially--will want to send it. Here are 2 ways (or places, rather) to physically send letters to Santa ... and two ways to email him. Because Santa gets so much mail, he has a special post office in a town named after him in Indiana (USA). This is a good option for getting letters to Santa, especially if students just want to send it. However, this post office will not send students a reply. Sending Physical Letters, Place #2: Santa's North Pole Address--BUT There's a Catch! Okay... if you want to be a real teacher hero then go to this website and get these instructions, especially if you have younger students who really want to send letters to THE North Pole--and expect a reply from Santa. The U.S. Postal Service has a very unique opportunity for students to get a reply, but it involves following some specific instructions that include someone writing "Santa's" reply letter and putting it in a separate, self-addressed envelope. So, you must read these directions on their website. If, as a teacher, you don't have time to do this for all of your students (i.e. write a Santa reply separately for each student), you can refer parents to the website or make photo copies of the instructions for them. These letters are sent to the closest Postmaster near Santa's home, which is in Anchorage, Alaska. The U.S. post office there takes the self-addressed envelop with "Santa's" reply letter sealed inside and post marks it with a special North Pole stamp before sending it to the address on the envelope. There are two good websites designed by "Santa" for sending him a quick email message. For these websites, all students do is fill in the blanks. If you don’t have a lot of time for students to write a letter to Santa (and want to use this as a lesson on using technology in writing instead), this website is the best and easiest for emailing him quickly. Be sure to have students fill in the bubble that lets Santa know they’ve been good. Then students write the item they want for Christmas in the next blank. And click the send button. It will generate a short email note to Santa. And they're done! If you have a little more time and want students to write an actual letter to Santa using email, you can go to this website. This website has more room for students to write a longer letter to Santa. They can tell him up to three things they want for Christmas. Santa also gives students more space to tell him something special. May be they want him to know all those good things they did this year. Or, you want students to tell Santa their plans for next year ... or "thank you" for last year's gifts. This website lets you do that. You could give students the questions in advance (i.e. put them on the board), and ask students write out the answers on paper first. Then, the next day, take students to the computer lab and ask them to type their answers in the blanks, and email/send their Santa letter. Students wrote a letter to Santa! Now what? Or drinking hot chocolate, helping decorate a Christmas tree, shopping for or making gifts for loved ones, volunteering in the community with parents or friends, or making room for all those new presents. Or, getting a few more academic lessons in before the break. Know another way to send letters to Santa? Do you know another way to send letters to Santa or have a great story about this? Share it!